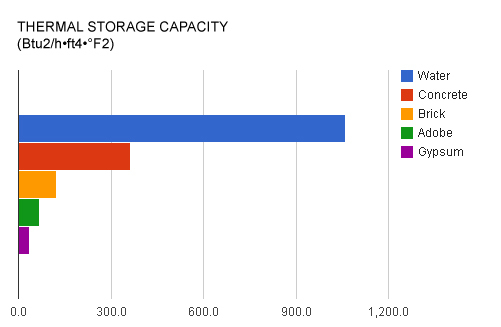 Has three times the thermal storage capacity of concrete. Has only half the weight of brick. Is abundantly available in the U.S. at virtually zero cost (at least for the time being). That’s right. I’m talking about water. The nectar of life. Throughout the history of passive solar heating, there are many accounts of innovative thinkers using water as a thermal mass. Steve Baer used 55 gallon water-filled barrels in his “Zomehouse” residence in Corrales, New Mexico, in the early 1970s. Throughout the U.S. southwest from the the late 1960s through 1980s, the late Harold Hay topped metal roof decks with clear polyethylene water bags. 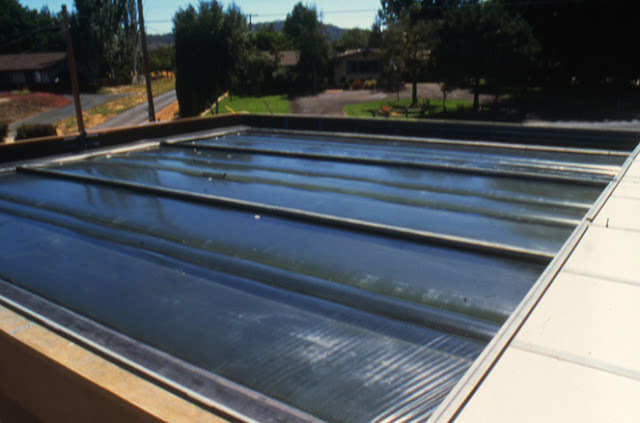 Solar pioneers John Reynolds and Ken Haggard have inconspicuously utilized concealed passive solar heated water tanks in various commercial structures since the 1990s. In all of these projects, the forward-thinking designers and engineers used water under the same premise: it has superior properties as a thermal mass. Let us consider the physics. The “Atascadero House” was build in 1973 and features one of Harold Hay’s roofponds. Thermal conductivity measures the heat (in British Thermal Units or BTUs) transferred through an inch thickness of a substance in one hour when the temperature difference between each side of the substance is one degree Fahrenheit. This measurement is made per square foot of substance. 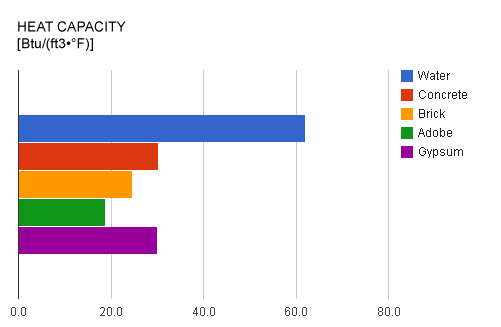 When the conductivity of water is compared to other common thermally massive materials, we see that the substance transfers more BTUs than concrete (Fig. 1). 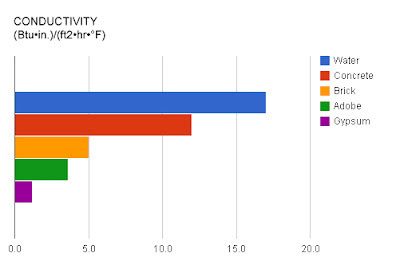 Note: The “conductivity” value for water takes into account the heat transfer effects of internal convection. Specific heat is defined as the amount of heat (BTUs) required to raise the temperature of one unit (i.e., one pound) of mass one degree of temperature (°F). Water needs over four times more heat to rise in temperature than either concrete or brick (Fig. 2). This means that water has the capacity to “absorb” more heat than other typical types of thermal mass. Density is simply the mass per unit volume of a substance – in other words, the weight in pounds per cubic foot. Water has about half the density of brick or about 40% the density of concrete (Fig. 3). 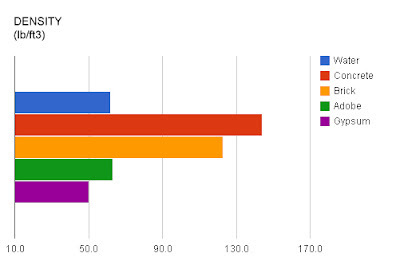 Interestingly, water and adobe weigh about the same. Heat capacity is the product of density and specific heat. Heat capacity is a better measurement of a substance’s thermal storage capabilities than specific heat because the latter does not take volume into consideration. Heat capacity indicates the amount of heat that can be stored in a substance per unit of volume (i.e., per cubic foot). 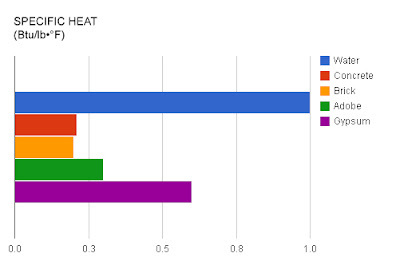 As indicated below, water is superior to concrete, brick, adobe, and gypsum in terms of heat capacity (Fig. 4). Finally, even heat capacity fails to address how well a substance will transmit heat away from its surface and distribute the heat throughout itself. Thus, we must take the product of heat capacity (i.e., density x specific heat) and conductivity to measure the thermal storage capacity of a substance. In terms of thermal storage capacity, water is far superior to concrete, brick, adobe, and gypsum (Fig. 5). Through this analysis, it is clearly evident that water is an ideal thermal mass. The trick for designers and engineers has always been figuring out how to harness something that is largely considered to be a liability for building envelopes. If a roofpond or water wall or thermal storage tank leaks, the water can quickly damage a building and the contents within.